When only the best will do, impress your baby shower guests with this elegant Crystal Pacifier favor. Today's baby may not be born with a silver spoon, but instead with a crystal pacifier! These engaging Baby Shower Favors are so beautiful that you can even use them as posh napkin holders. 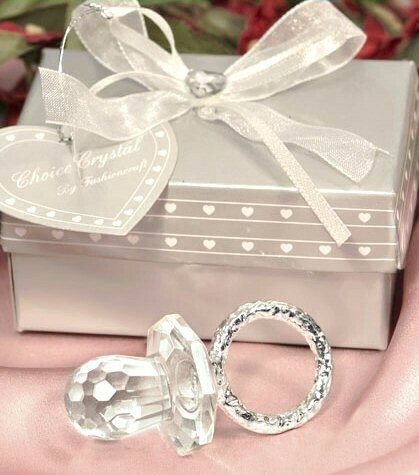 Each brilliant bauble is 2 1/4” x 1 1/8” and features a shimmering multifaceted clear glass crystal pacifier finished with a shiny chrome-like embossed ring handle. The luxury continues with the signature silver heart design 3.25” x 2.25” box where the favor is surrounded by satin and tied with a white organza and satin bow with a crystal heart. The gift includes a attached matching heart shaped tag. What a stunning presentation!